I’ve been working on bringing more of a teamwork feel to our projects for 2 years. It has proven to be a non-trivial task. Any advice? Now, just so we’re clear here, I know this guy pretty well. He’s a very good manager, and he runs a software development group with some of the smartest people I’ve met professionally. They’re definitely a functioning group: they’ve been building software for years, and that software is used in production in critical applications at his company. By many accounts, his group is successful. But when I took a closer look at how that particular team works day-to-day – and this should seem very familiar to a lot of developers – I definitely saw what he meant about it being a non-trivial task. There’s definitely a lack of a teamwork feel on the various projects his team works on. Everyone is really good at carving out his or her own piece of work, and is able to work on that piece independently. But even when multiple people would work on a single release of the same piece of software, they’d work independently of each other, not really talking amongst themselves. Don’t get me wrong – they definitely get their jobs done. But they’re working on individual tasks, not team projects. And even when those tasks add up to projects, it just feels like loosely connected tasks to the people working on them. So what’s the harm in that, if they’re getting the work done? Well, for one, having a group of people working like that doesn’t exactly encourage innovation. There are some genuinely brilliant people on that team, and they do reasonably good work, but I would honestly expect more innovative work from this particular group of people. And I believe that having more of a “teamwork feel” would encourage more innovative work. What’s more, I got the feeling that this particular team still runs into a lot of the same problems that many other, less talented teams run into, and I think those problems could be improved through better teamwork. They have some serious change management issues, where they often have to rework their code because it doesn’t quite meet the needs of the projects’ users. They have a few code quality problems – they’re trying to address them with better code reviews, which they’re having trouble getting off the ground. And they have an overall client relationship problem, where the people they build software for often feel like they’re somewhat disconnected, like they can’t quite the software that really meets their needs. Again, these are highly talented, very smart developers, with a manager who’s on the ball – and they’re still getting stuck on the same problems that hit everyone else. Now, I don’t want to make the situation sound worse than it is. The manager has made some very good progress in getting the individuals working in a more team-like way. One thing he did that I really like (and I think it worked really well) was to really encourage everyone to write things down in the Wiki. And this wasn’t just a general edict (“Each person must add X wiki pages, or else!”). It was actual encouragement and support, treating documentation like it was a real and highly appreciated part of peoples’ jobs. Like a lot of new tools, there was a slow start to it, but once a few people dove in and started to embrace it, it started to really take off. And a funny thing happened: as people started sharing information with each other, they started to learn more about each others’ work, and some of them started to get that “teamwork feel” that they were looking for. So what’s going on with this person’s group? And, more importantly, what can he do to help improve the “teamwork feel” for everyone? There are different kinds of teams. In sports, for example, a basketball team’s positions are dynamic while baseball team members have more static roles. However, in both cases the members must all work together cooperatively. Conversely, wrestling and track teams are composed of individual competitors who do not dynamically interact, although the members support each other socially and emotionally. 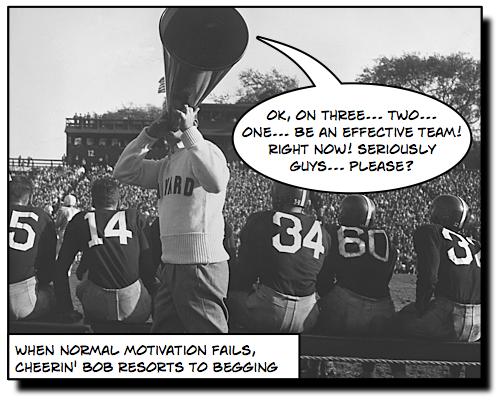 In engineering, development teams often behave much like baseball or basketball teams. Even though they may have multiple specialties, all the members work toward a single objective. However, on systems maintenance and enhancement teams, the engineers often work relatively independently, much like wrestling and track teams. A team is more than just a group of people who happen to work together. Teamwork takes practice and it involves special skills. Teams require common processes; they need agreed-upon goals; and they need effective guidance and leadership. When I reread that quote before pasting it in here, something in that last sentence stood out to me: they need agreed-upon goals. Now, I’ve been referencing that quote for almost a decade. But it’s really interesting to me that I always overlooked that last bit. But working on Beautiful Teams really taught me the value of agreed-upon goals. It was pretty remarkable, actually: contributor after contributor brought up the idea that the people on a project all need to be aligned to the project’s goals, and to have a single, overarching vision that the team can rally around. First, the team leader needs to establish an elevating vision or goal, and I think that this is truly a leadership function, not just management. It goes beyond the management function. An awful lot of thought should go in on the part of the team leaders into what is the team’s goal and what is it about it that is not just trying to trick the team into thinking they have a goal that’s elevating or inspiring, but to come up with one that truly is. A classic example is if you’re out digging ditches, that’s not very elevating or inspiring. But if you’re digging ditches to protect your town that’s about to be attacked by an enemy, well, that’s more inspiring, even though it’s the same activity. And so the leader’s job, really, is to try to determine or frame the activity in such a way that people can understand what the value is. < Previous Beautiful Teams — on its way!